Have you ever wondered why a jersey or a uniform is given so much importance in sports? Let’s explore the inside story of the jersey. Uniforms are sets of clothing worn by a particular set of members. For example - Doctors and nurses have a particular uniform. Drivers and bus conductors wear uniforms. A fireman wears a particular suit that saves them from the fire. And, in the same manner, a uniform is important in sports. One of the most important things in the world of sports is uniform. Every sport tends to have a particular set of uniform. In soccer/football, a player needs shorts, jersey, socks, cleats and shin guards. Apart from these, a football player needs to pads and helmets. These accessories particularly help the athletes to stay safe and play with full concentration and effort. Taking point into the importance of a uniform, you can choose from a variety of football jerseys. DRH Sports is leading American Football Uniform Manufacturers which are known for unique and high-quality uniform manufacturing, supplying and distributing from Pakistan to all over the world. The football industry is blooming at a hasty pace. The increase in the popularity of football has attracted and increased the number of jersey manufacturers all over the world. 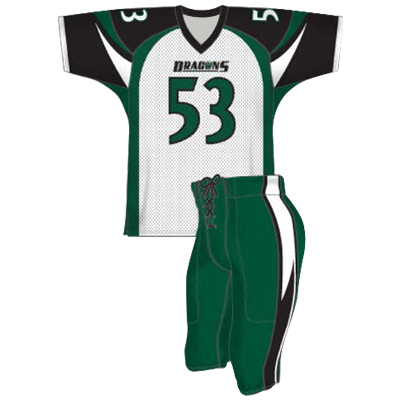 There is a large number of manufacturers which allow you to customize and create your own uniform. It has increased the competition in the football industry and every manufacturer strives to deliver the best from others. Most of the manufacturers offer customization of the uniform according to the needs and specifications of the customers. DRH Sports has successfully earned a reputed name in the Sports Uniform manufacturing domain. They are amongst the leading Sublimated as well as Football and Rugby Uniforms Manufacturers, Suppliers and Exporters from Pakistan. Time to dress up your team with top class uniform! !